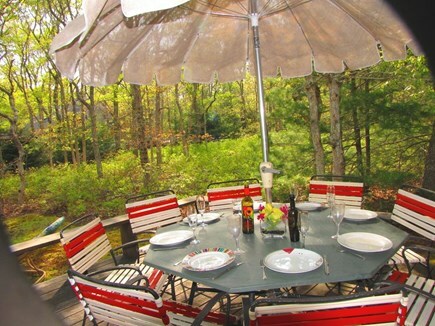 Dine on the deck, in the secluded back yard. Plenty of furniture. Secluded area... plenty of parking. Sunny living room-open floor plan, - stereo, Flatscreen TV, DVD. Relax in the beautiful Sun Room. Jog, walk, roller blade & bike on forest bike path next door! 2 Remaining weeks- Aug 30 or 31- Sept 13 or 14th. Fri/Fri or Sat/Sat rental dates. $200 off two wks. 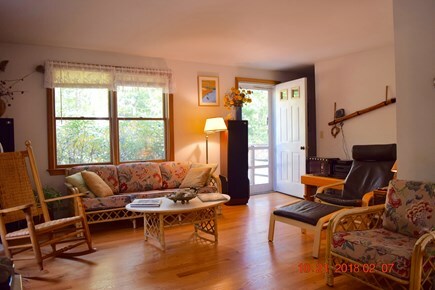 This secluded, four bedroom, two full bath home is located at the end of a country road sitting on the state forest bike path where you can jog, walk, bike & roller blade. 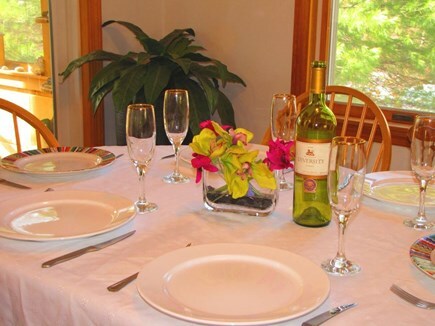 Elegantly furnished, comfortable & fully equipped, the home faces south where trees keep is shaded and cool. Plenty of off-street parking. 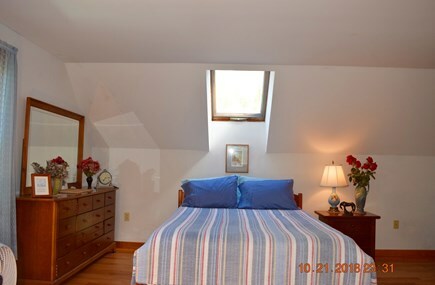 Inside: Upstairs, there are two bedrooms, each with a queen bed--under skylights (watch the stars). 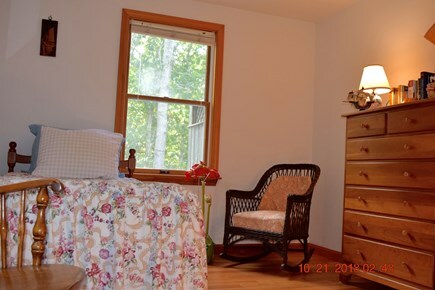 Both bedrooms are very spacious with plenty of closet space and sitting areas. 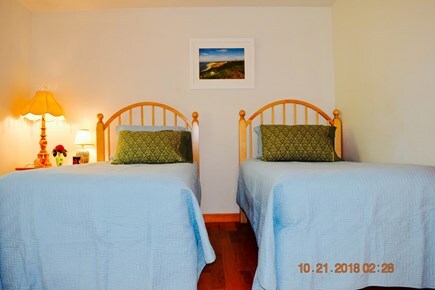 Downstairs, there are two additional bedrooms, one with two twins, the other one twin, (additional twin memory foam mattress upstairs). All beds have new mattress covers & pillows. There is a room air conditioner in each of two master bedrooms. Outside: Large deck with a Weber gas grill and cooking utensils. There's a shaded dining table that seats eight, two matching chaise lounges (extra chairs and lounges in basement), enclosed, private hot-water outdoor shower, beach chairs (four), secluded hammock. Beach cart, boogie boards. 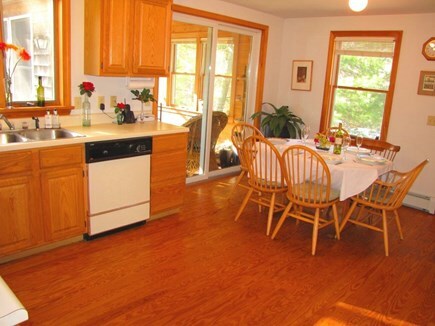 Kitchen: Sunny kitchen-open floor plan, hardwood floor. Sliders open to the Sun Room. Equipped with: dishwasher, coffee grinder, coffee maker, toaster, toaster oven, ceramic tea kettle, lobster cooker, full compliment of cookware, bakeware, and utensils. 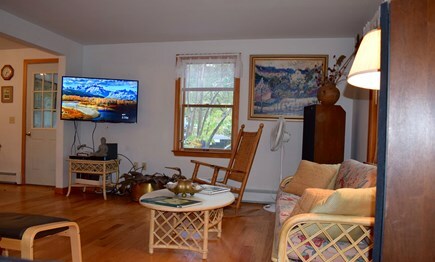 Living room: Quality stereo system, Sony Flat Screen TV, Comcast cable, with VHS, and DVD players as well as high speed internet. Basement: Washing machine and dryer, pool table. Two mountain bikes, and one road bike ready to use. Other: We provide toilet paper, dishwasher, and laundry detergents. Please bring your own bed linens and towels. 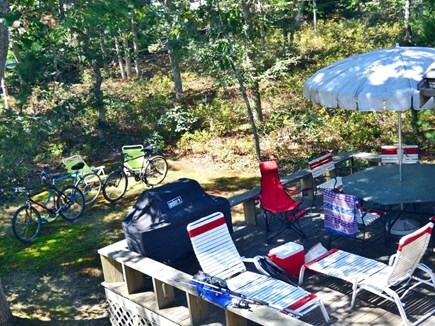 A ten minute drive to the Lambert's Cove town beach, the Trustees of the Reservations beach/West Tisbury's great pond/wildlife sanctuary, and Uncle Seth's freshwater pond or Ice Pond public swimming area - great for children. Additional pricing info: $200 cleaning fee & 300 security deposit. State and local taxes of 5.7% will apply. Rent this lovely, clean, spacious, comfortable, private and centrally located house! This lovely house is exactly as advertised – clean, spacious, comfortable, private and centrally located. Recently updated with beautiful hardwood flooring, the house is homey without being pretentious. There were 5 adults in our group and we were very comfortable there. We did choose the muggiest week of the summer to visit MV but numerous fans and plentiful windows kept us comfortable. The outdoor shower was a great place to rinse off and cool down after a busy day. Steve is a conscientious owner who made the rental process easy and seamless, and who was always accessible if we needed him. He’s a wealth of knowledge about the island, activities and events and is generous with his advice. There is a collection of brochures, maps and guides at the house to help you plan your trip, and its location in the center of the island was close to anywhere we wanted to go. We loved being next to the hiking/biking trail, which we used daily. We used two of Steve’s bikes, which he generously lets renters use. Per his suggestion, we also got a beach pass to Lambert’s Cove and used it three days. There’s something magical about walking down the wooded path to this gem of a beach that never got overly crowded. The deck was our favorite place to hang out in the late afternoon/early evening. The new grill is ideal for burgers, lobster tails, corn on the cob or whatever you bring home from the market. The stereo system is top notch and there’s a diverse collection of CDs to listen to. Steve’s detailed instructions for the TV, stereo, and DVD player are super helpful. The house comes with wi-fi so you’re never unconnected if you don’t want to be, and there are a good number of books to keep you occupied if you’re stuck inside because of weather. Regrettably we never had a chance to use the pool table. Finally, the beds were super comfortable, and the rooms were spacious with loads of closet and drawer space. Seating in each bedroom gave everyone space to relax in private if we chose to. Two people in our group had to put in a few hours of work and had no problem finding a quiet, connected place in the house to do so. Terri, It was a pleasure to share our home with you. Every year we make improvements. Last year it was new hardwood floors throughout the house. In June, cutting back the trees to open up the backyard, new lounge chair for the living room, high end dehumidifier in the basement, and a tile floor in the sunroom. In 2019 we are adding air conditioning units to the two upstairs master bedrooms. Convenient location to all island points. Works well to accommodate different age groups of family members. A short ride to our favorite beach - Long Point, as well as the Farmer's Market, Cronig's and Vineyard Haven. The home is spacious and allows for everyone to relax comfortably. The homeowner was very attentive to our questions and checked in with us during our stay to make sure we were comfortable. 1. 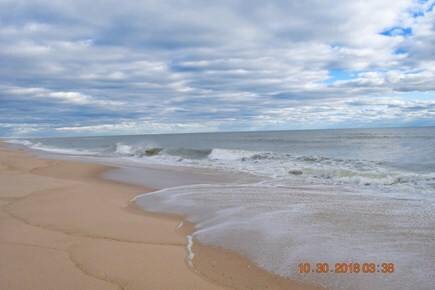 Rent a kayak or stand up paddleboard at 600+ acre Trustees of Reservations Long Point wildlife refuge beach to tour endless Long Cove Pond ideal for kids, and bring your boogie board for the surf on the ocean side. 2. Linger at beautiful Lamberts Cove beach, never overly crowded, perhaps the best family beach on the island. Bring a picnic and come back to watch the sunset without Menemsha’s evening crowds. 3. A ten mile newly paved trail circumvents the state forest right in back of the house. 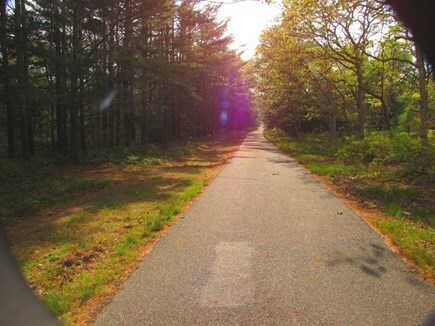 Bike trails extend all the way to Edgartown. three bikes to use at the house. 4. Having two master bedrooms upstairs allows us to bring our two girls and add another couple and their one-two kids to make the rental very affordable. 5. In an era where work intervenes, you can always find a quiet spot to get it done quickly in any room & get back to having fun. 6. Peace and quiet – birds, bunnies, crickets, fireflies - at the end of a country road during the height of the busy summer season. 7. 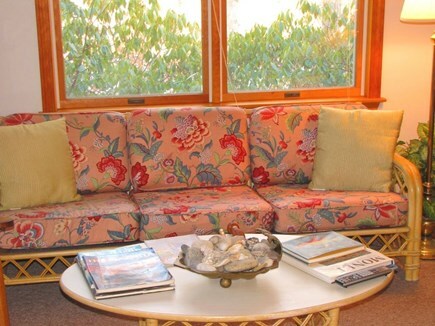 West Tisbury is our favorite town – central location, best beaches, best library, Sat. farmers market, Icehouse & Seth’s ponds for the kids, Scottish bakehouse for breakfast, go fancy at State Road restaurant, hike Cedar Tree Neck reservation, yoga classes at the Yoga Barn, horse rides at Arrowhead farms. 8. The owner is attentive - checks in to make sure we’re settled on arrival ask for feedback when we leave & acts on good suggestions. In 2018 he added new hardwood floors everywhere, new grill, some new furniture. In 2019 he’s adding air conditioners to the upstairs master bedrooms. 9. 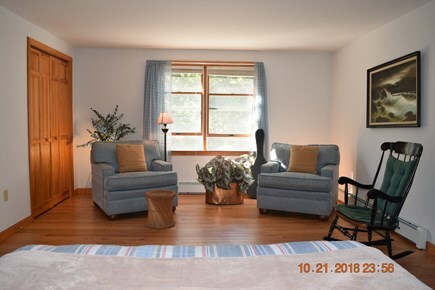 Our primary needs are met – wi-fi, cable/HD 50 inch TV, comfortable beds, grill, outdoor shower, 3 bikes, pool table, plenty of cookware, and the central location means 20 minutes to Circuit Ave/Oak Bluffs, Aquinnah Cliffs, Menemsha sunsets, downtown Edgartown & being up-island means less summer traffic. Ten minutes to Lamberts Cove/Seths Pond. 15 to Long Point. 10. The house has an audiophile quality stereo system which opens your ears up to sounds you didn’t know were there. My Love and I, and her 23-year-old son and his friend, rented the home from Steve. The house is big enough for privacy: The young men stayed downstairs in separate rooms, while we stayed upstairs in the master bedroom. 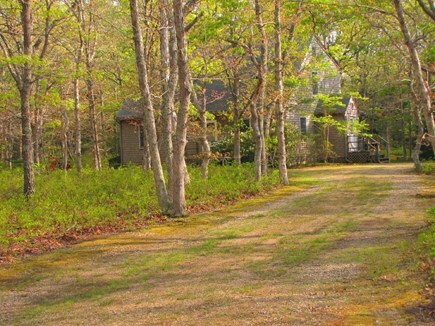 We chose this home because we like quiet; it is on a quiet street in West Tisbury. The surrounding shade trees provide for maybe 10 degrees cooler inside the house than outside, on a sunny day. We chose Sept 10-16, 2017 because it was just past the busy season (more quiet), yet the Fishing Derby was in progress. The young men were there for the renowned striped bass and black sea bass fishing, along with the night life. Steve has a buddy who owns a small motorboat, and the man took the young men and me out on two different afternoons, fishing, for a reasonable fee. (Fishing licenses are easy to get online - the home is wired with Comcast, and Steve directed us to his favorite nearby bait shop). We were in the Aquinnah area, the west side of the island, and we each caught striper schoolies. We caught 3 keepers among us, took a 31-inch and a 34-inch striper home and released a 29-inch. We fileted both of them back at the house, froze one to take home and grilled one (on the outdoor grill) for family dinner in Steve's kitchen. Another evening, the young men and I drove through Edgartown, took the brief car ferry to Chappaquiddick and drove down to Wasque for some night fishing. If you live in the city, you'll enjoy the stars scintillating in the night sky and the baitfish jumping out of the water in a pool between sand banks. In July of 2017, my two 9 year old, twin daughters, my wife, and I began our first Vineyard vacation at [this home] in West Tisbury. The kids liked the pristine beaches at Katama, but watch the undertow if you go there. The Lambert’s Cove beach is more kid friendly as far as watchful eyes are concerned. The kids were very excited to see cows, llama's and sheep (none in Andover). We stopped at Ghost Island farms on State Road for veggies and to see cows. Across the street is Chilmark Pottery where Geoffrey Boar, the potter, made a special pot for the kids and got them excited about pottery. There is nothing like watching your kid, sitting on the Flying Horses at the Oak Bluffs Carousel gleefully stretching to reach a gold ring on the Merry Go Round. The carousel is over 100 years old. The island captured our attention. The home was great and the owner (Steve) called us when we arrived to make sure we were settled in, and checked in with us in the middle of the week as well. We did the usual things – trips to the beach, kid games, and ice cream on Circuit Ave in Oak Bluffs, wandering through the Gingerbread Houses at the Campground Meeting Association, grilling on the deck, stopping at the Net Result Fish Market, shopping at Cronig’s, and stopping at a few inexpensive restaurants for family meals. We slept well. 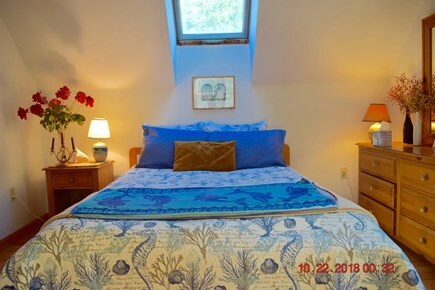 The upstairs essentially has two master bedrooms with queen beds, so if you are two couples partnering up, with two or three kids in total that’s a nice arrangement, and makes for a very affordable vacation. My wife and I, our two daughters 9 & 11, also our 17 year old son and his friend rented the house at 281 Oak Lane directly from the owner Steve C for the fourth of July week. This is a busy week on the island with a lot to do including the Edgartown fireworks. Twice we went to the Lamberts Cove town beach (a pass is $50) and once we went to the stunning Trustees of the Reservations beach (south facing ocean, plus a safe for kids salt pond) both in West Tisbury where the house is located. 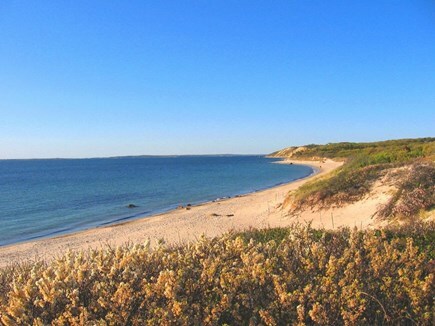 No one should miss a ride out to Aquinnah or Gay Head cliffs, with the Gay Head light and view of the Saint Elizabeth Islands or the sands of Mosup beach. My son and his friend were engaged with playing frisbee in the park in Tisbury, and jumping off the bridge on State Beach in Oak Bluffs. My daughters made friends in the area of the bridge which is a social gathering area for kids of all stripes. Lets talk about the house. We arrived and it was neat and clean. The owner greeted us as he was departing as we were arriving. Really nice guy-took time to show us how everything worked and all kinds of ideas on things to do. In season, the house rents for $1950 a week and is well worth the investment. If you want our week rent in January or no latter than late February as Ferry tickets will be in short supply not long after that, if you wait. What stood out about the house? The owner is an audiophile and has a stereo system that sounds like nothing you've heard before with lots of CD's to capture your attention. We (my wife & I & our son) were captivated by the soothing sounds of Enya and played that CD repeatedly as we relaxed and destressed in the quiet surroundings of the house. 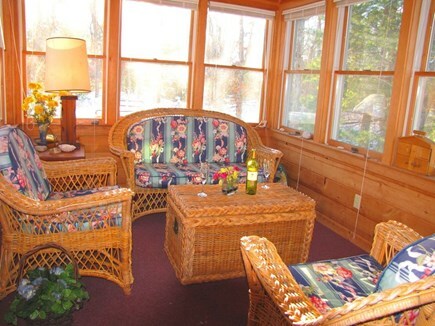 I liked reading in the sunroom and we made full use of the deck and the outdoor grill. The beds in the master bedrooms are new and very comfortable. The owner had beach chairs, boogie boards, frisbees, & a beach cart to tow things easily in the basement. You are one house back from a bike path whose ten mile path through the forest attracts the first family every season. It all adds up to a happy, renewing vacation. 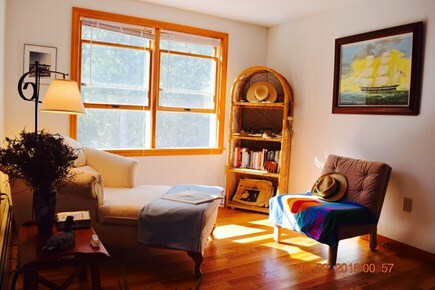 I would not hesitate to rent this home again, and if you haven't you won't be disappointed if you like quiet, nice amenities, accessibility to the less frantic parts of the island, lots of great restaurants, and plenty to do for the younger members of the family. The house is comfortable. It gets a lot of shade, and therefore keeps relatively cool in warmer weather. There are four bedrooms - 2 upstairs and 2 downstairs, and it felt like there was room /space for privacy. There are also some comfortable common areas - including a deck, a porch / glassed-in room leading to the deck, and a kitchen / dining / living room area. The house was clean. 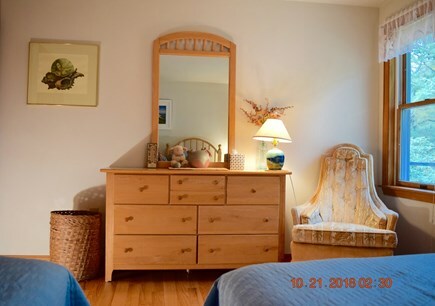 The location is great - right next to bike paths in the state forest; you can follow the paths to roads that will take you to Oak Bluffs, Vineyard Haven and other parts of the island. The house is also pretty close to the Scottish Bake House, Up Island Cronigs, Trustees of Reservations Long Point Beaches, Seth's Pond, The Ice Pond, Lamberts Cove beach, and Cedar Tree Neck Wildlife Sanctuary. Our family enjoyed the Saturday West Tisbury Farmers Market, The AG fair, Chilmark Flea Market, middle road farm's Mango Lassi and watching the sunsets with Lobster, clams, and corn takeout in Aquinnah. I recommend this house rental to others - based on price, location, and amenities. Very Nice, Spacious property at a great price. This property was a bargain compared w/ it's location. Close to the State forest and coming supplied w/ bikes. We had several runs, and bike rides on the well kept paths of the state forest. The house itself has 4 spacious bedrooms and is well kept. We spent a lot of time on the deck enjoying the Vineyard July weather. 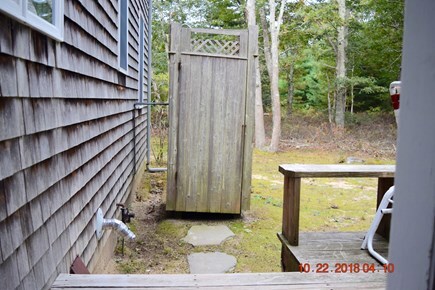 The property also offered ample privacy due to its location. Both the agent and owner made the business side seamless. I would highly recommend this property. After years visiting the island to stay a weekend at the Youth Hostel, I built the house in 1992 on an acre and a half of land abutting the State Forest. My parents fell in love with the island and enjoyed spending time there. It pleased me to see them holding hands on the beach and looking like the young lovers they must have been before I, my sister and brother entered the picture. In 2007, I met my wife and introduced her to my favorite activities on the island -- fishing, kayaking, visiting art galleries, savoring the different beaches - Lambert's cove, the Trustees of Reservations lovely beach on long point with a salt pond for kids to play safely, swimming at the newly acquired land bank property - the old ice pond, snorkeling, the art movie house in Tisbury. She loves going to the Scottish bakehouse or ArtCliff diner for breakfast, the Lookout tavern, Offshore Ale, or Barn, Bowl & Bistro in Oak Bluffs with friends and family. Taking an outdoor shower after coming home from the beach nourishes the soul. We'll head on the bike path at the end of the road, for the ten mile loop around the State forest, and sometimes roller blade the whole way -- great exercise. The neighbors dog likes to check out new renters, roll around on his back, show a little love, and hope for a tasty treat from the grill. and I left south facing trees near the house, to naturally cool it in the heart of summer. Its nice to fall asleep upstairs looking at the stars, to sometimes hear wild turkeys nesting in the tree outside the window, and recently a Great Horned Owl so close I felt I could touch it. I leave 3 bikes at the property so renters can get out and enjoy the natural surroundings. Since we didn't intend to rent it when we furnished the home, it has a nicer presentation than the average Vineyard home. Being an audiophile, I have a high end stereo in the living room to go with the 50 inch flat screen TV. Hopefully, you'll be too busy, to bother much with those, and spend more time grilling on the deck, or jumping in the outdoor shower, after returning from a day at the beach. In the summertime, particularly in July and August, traffic builds on Vineyard Haven, Oak Bluff, and Edgartown roads. Up Island, from West Tisbury, to Aquinnah, are more peaceful and relaxed. West Tisbury, has a more rural character, with more farms, woodlands, and hiking spots. Lambert's Cove beach, a ten minute drive, offers a tranquil sheltered cove, with salt ponds like bookends on either side, for sun bathing, swimming, or packing a dinner and wine, to watch the sunset in the evening as many families gather to do. The Trustees of Reservations Long Point beach, has a south facing surf beach, plus a sheltered salt pond oasis for kids to play safely, with an Osprey nest, and hungry young chicks right out of the parking lot. Once a private pond, the land bank, purchased access to the Old Ice Pond, with trails to the water, and a lovely dock to jump into pristine fresh water. And uncle Seth's pond is on the way to Lambert's Cove on Lamberts Cove road. Cedar tree neck wildlife sanctuary, off Indian Hill road, has walking trails to the beach, salt pond, and a hike not unlike a trip into a haven for Hobbits, with a spectacular cliff overlook of the Elizabeth Islands. West Tisbury has the Agricultural fair in August, the farmers market every Saturday, the artisans festival, the Granary and Field Art galleries, Arrowhead farms horse rides, Polly Hill Arboretum, the post and beam Yoga barn, Chilmark Pottery and MV Glassworks.